Objective: The aim of study is to investigate the relationship between neuropeptide Y (NPY) and insulin resistance which is important in the pathogenesis of poliycstic ovary syndrome (PCOS). Material and Methods: This study was conducted between May 2012 and May 2013. The study included 45 patients with PCOS and 44 healthy controls at productive age. Insulin, fasting blood sugar, follicle-stimulating hormone (FSH), luteinizing hormone (LH), prolactine, testestorone, dehydroepiandrosterone sulfate (DHEA-S), thyroid stimulating hormone (TSH), cortisole, estradiol, NPY levels were measured at early follicular phase in patients with PCOS while insulin, fasting blood sugar, prolactine, DHEA-S, TSH, cortisole, 17-OH progesterone levels were measured in control group. Homeostatic model assessment for insulin resistance (HOMA-IR) scores were calculated and antrepometric measures recorded. Pelvic ultrasonography was performed. Results: Fasting insulin levels and HOMA-IR scores showed insulin resistance to be higher in obese patients with PCOS than healthy control subjects and patients with normal weight PCOS. NPY levels found to be higher in obese-overweight patients with PCOS than healthy control subjects and patients with normal weight but it was not statistically significant (P>0.05). NPY levels did not differ in patients with and without insulin resistance. Conclusion: No correlation dedected between insülin resistance and NPY levels but NPY levels were high in overweight PCOS patients. DHEA-S, TSH, kortizol, 17-OH progesteron düzeyleri incelendi. testi skorları hesaplandı ve antropometrik ölçümler kaydedildi. 3. Kayaalp O. Tıbbi Farmakoloji. Cilt:2 9. Baskı. Ankara: Hacettepe Taş Kitabevi, 2000. 5. Azziz R, Carmina E, Dewailly D, et al. The Androgen Excess and PCOS Society criteria for the polycystic ovary syndrome: the complete task force report. Fertil Steril 2009;91:456-88. doi: 10.1016/j.fertnstert.2008.06.035. 32. Mircea CN, Lujan ME, Pierson RA. Metabolic fuel and clinical implications for female production. 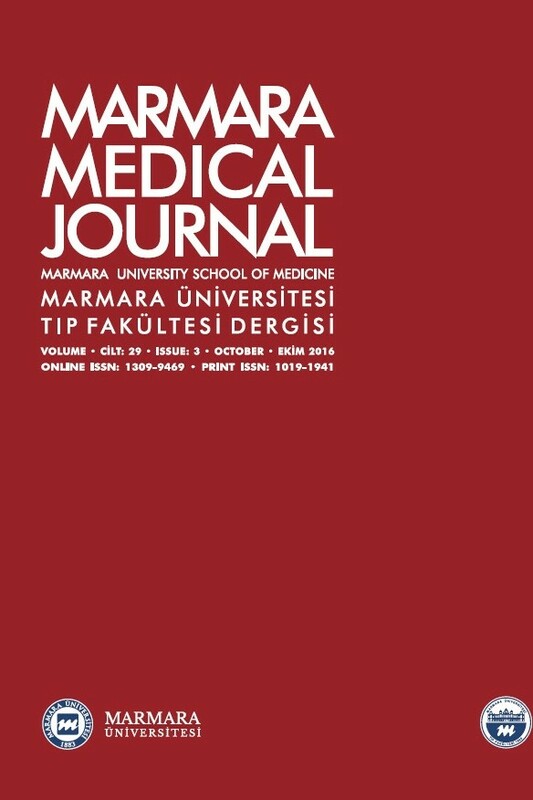 J Obstet Gynaecol Can 2007; 29:887-902. doi: 10.1016/S1701- 2163(16)32661-5. 37. Gunes M, Bukan N. Examination of angiopoietin-like protein 4, neuropeptide Y, omentin-1 levels of obese and non-obese patients with polycystic ovary syndrome. Gynecol Endocrinol 2015;31:903-6. doi: 10.3109/09513590.2015.1068285.